If you follow our Instagram, you know that we are fans of working with neutrals. Today, we celebrate our favorites: Black and white. It always works and it will never go out of style. Exterior or Interior. The combination is both easy and dramatic. Formal, yet comfortable. A big white house has become a full tilt fascination (Thanks, Mark D Sikes). Add black windows and all of the sudden, it's very now. The black iron window trend continues and some folks aren't insisting on the iron. Black painted wood framed windows get the look for far less cost than Iron. 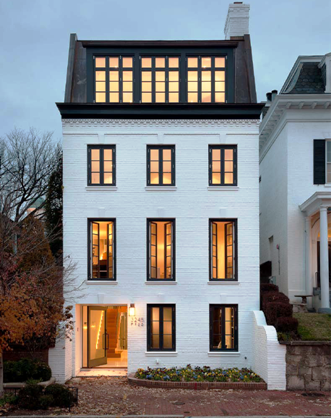 Above is one of our favorite exteriors in Georgetown. On the inside, B&W works best when paired with warm natural elements like raw wood floors or thick abaca rugs. In our own living room there's plenty of white and natural. We've added black and white art pieces to get our B&W fix. Photography from Rob Brinson, a painting from Kayce Hughes and other B&W photos and paintings give the entire living space a hip, lofty feeling. Pencil & Paper Co. are famous for their colorful, happy spaces but even they fall for black and white on occasion. The twin bed situation above takes advantage of the black, white and neutral idea with plenty of pattern and texture to spare. Black and white and happy. 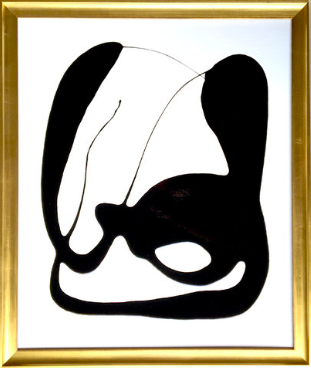 We've recently discovered the work of Dan Mazzarini in New York. He is not a stranger to black and White. If you find you need more white ... just paint the floor! We adore this space. Several of our Serenbe neighbors also have homes in Atlanta (ITP). Meet the Olsens, a busy family of four. Jeff (Dad) has a creative gig in Atlanta and Monica (Mom) runs marketing for Serenbe. So if anybody needs to be in both places, it's the Olsens. For their Atlanta home, they chose a modern townhouse in Midtown. They needed something easy, comfortable and family friendly without sacrificing style. We worked with them to furnish the space with modern ease. A modern, minimalist vibe needs quality furnishings to work. For the living room, two large grey flannel sofas anchor the space and a traditional rug from Moattar gives the house a sense of gravitas and history. The oversized Random Light pendant by Bertjan Pot for Moooi is both subtle and impactful. The coffee table centered between the sofas is an elegant and easy piece from Bungalow Classic. All of the floors and wood details were finished to a matte blonde to create a fresh and bright feeling throughout. The light wood plays nicely off the marble waterfall island. Counter stools are Charles and Ray Eames for Herman Miller. The dining room boasts a Moooi Heracleum Endless pendant and teak chairs by Kai Kristiansen for K.S. Mobler of Denmark. The Olsens found the chairs antiquing when they lived in San Francisco. The kids' rooms are playful and stylish. One of the rooms has Miles Redd for Schumacher wallpaper on the ceiling paired with a George Nelson Crisscross Saucer pendant. The other kids room has tall ceilings from which we hung a Serena & Lily wicker pendant. The master enjoys a Schumacher natural grass cloth wallpaper as the backdrop for many modern furnishings including a Moller Model 63A Bench and a Tom Dixon Beat Pendant. May the Olsens nest and flourish. The coffee table is the center of the room. So why do we all neglect it? Follow along with us as we share projects, inspiration, and witty words of wisdom.